CHARLOTTE, N.C. -- When the governor declares weather conditions are so horrific, everyone should stay home, the lineman gathers his gear and heads to his truck. He kisses his family goodbye, knowing he may be away for days or even weeks, until everyone has their electricity restored. Sixteen-hour days, biting cold, blinding snow, drenching rain, tropical-force winds, he surveys the damage nature has done and determines the course of action that will repair the damaged system and return people's lives to their normal routine. He doesn't look for praise... he's just doing his job. April 18 is nationally recognized as National Lineman Appreciation Day to honor line workers and their role in building, maintaining and restoring service that powers the lives of our customers. U.S. Rep. Mick Mulvaney (R-S.C.), along with a number of bipartisan cosponsors, and U.S. Sen. Thom Tillis (R-N.C.) have made their support official. Mulvaney and the entire South Carolina House delegation have introduced a resolution, and Tillis plans to introduce a resolution designating April 18, 2016, as National Lineman Appreciation Day to recognize linemen, the profession of linemen, and the contributions these brave men and women make daily to protect public safety. "I was proud to be involved in designating April 18 as National Lineman Appreciation Day," said Rep. Mulvaney. "These folks are on the frontlines working to keep our power on – often in difficult circumstances when the weather is at its worst – and they deserve to be honored for their efforts." "With April 18, 2016 being designated as National Lineman Appreciation Day, we recognize the resolute men and women who labor for us every day," said Sen. Tillis. "Thank you to the unsung workers who work diligently to help ensure the safety, reliability, comfort and convenience of electricity that families and businesses throughout America rely on." More than 5,000 line workers are part of the Duke Energy family. They, along with thousands of contract line workers, construct, operate and maintain equipment and more than 295,000 miles of power lines that deliver electricity to more than 7 million customers – representing a population of more than 24 million people – across its service territories. 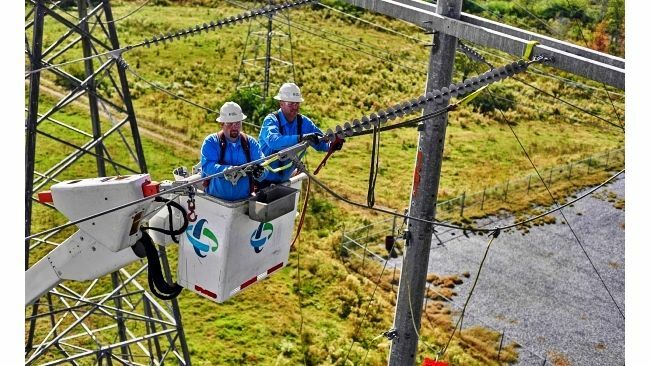 "Our line workers are the heart and soul of Duke Energy," said Lloyd Yates, executive vice president of market solutions and president of Duke Energy's Carolinas Region. "They work in challenging conditions to power our customers and communities. We are proud to honor line workers who keep the lights on for millions of people throughout our six-state service area." Those who wish to honor line workers and their families are encouraged to use the hashtag #ThankALineman in social media. For more information about Duke Energy's line workers, follow @DukeEnergy and visit www.facebook.com/DukeEnergy. Here is file footage of linemen performing storm preparation and restoration efforts: http://news.duke-energy.com/multimedia-gallery/b-roll#lg=g1&slide=5. To view a letter from a lineman's wife expressing her appreciation for her husband's job serving the community, visit: http://illumination.duke-energy.com/articles/my-husband-the-lineman.